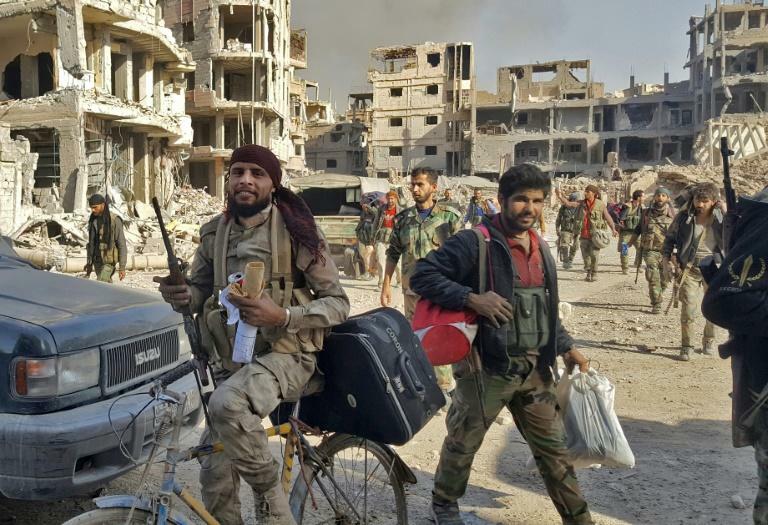 Syrian and allied forces converged Saturday on holdout Islamic State group fighters in the Syrian border town of Albu Kamal, the jihadists' very last urban bastion following a string of losses. 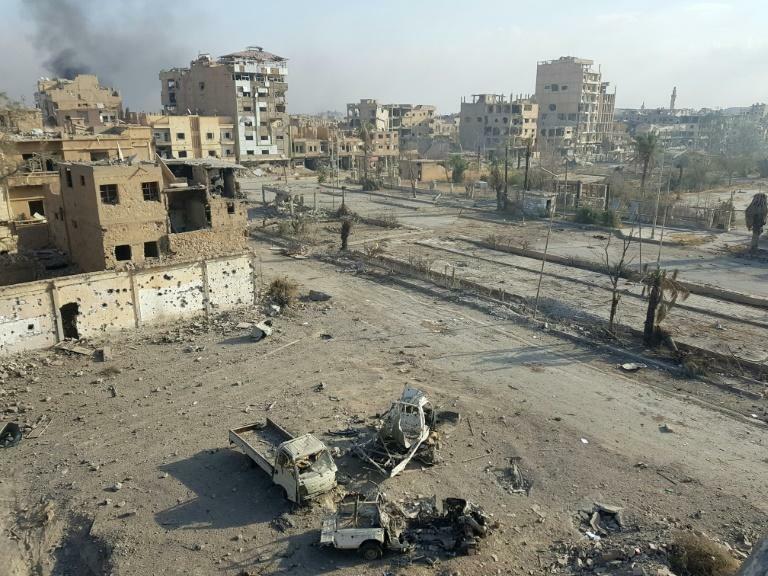 On Friday, Russian-backed Syrian regime forces took full control of Deir Ezzor, which was the last city where IS still had a presence after being expelled from Hawija and Raqa last month. On Saturday, a car bombing carried out by IS killed dozens of people displaced by fighting in the province, the Britain-based Syrian Observatory for Human Rights said. The borders of a "caliphate" that three years ago spanned territory in Iraq and Syria roughly the size of Britain further shrank on IS's surviving fighters when Iraqi forces retook Al-Qaim, also on Friday. The town lies along the Euphrates River in western Iraq and faces Albu Kamal, where many of IS's remaining fighters are thought to have regrouped. The Syrian army and allied militia groups were still some 30 kilometres (nearly 20 miles) from Albu Kamal, but Iraqi paramilitaries crossed the border to take on IS, the Observatory said. 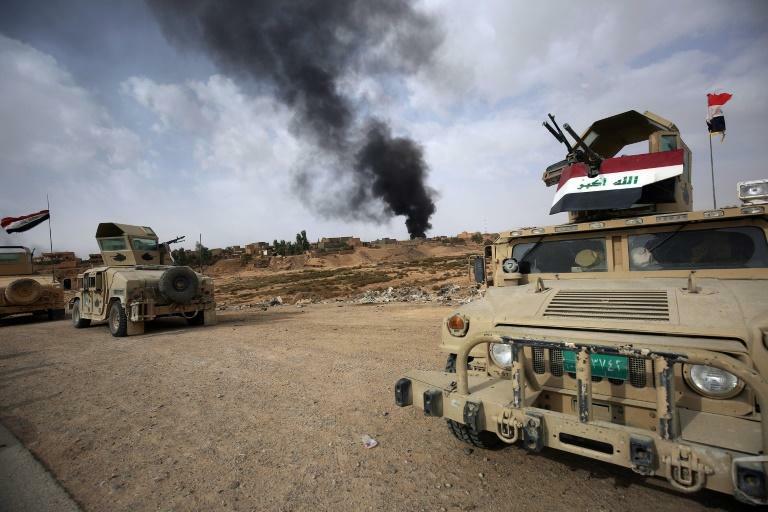 "Fighting pitted Hashed al-Shaabi units against the Islamic State in the Hiri area," said Rami Abdel Rahman, who heads the Britain-based monitor. Hiri, just across the border from Al-Qaim, on the outskirts of Albu Kamal, is now the last town of note still fully controlled by Abu Bakr al-Baghdadi's jihadist group. Abdel Rahman said IS was able to pin back the Iraqi forces. The Hashed al-Shaabi (Popular Mobilisation) are a paramilitary umbrella dominated by Shiite militia outfits loyal to Tehran. The Syrian regime forces, backed by intensive Russian air strikes, are advancing on Albu Kamal from an oil pumping station in the desert west of the town. Kurdish-led US-backed fighters from the Syrian Democratic Forces were making fresh gains further north in Syria's eastern province of Deir Ezzor, the Observatory said. The offensives were more simultaneous than coordinated in the border area, where the myriad armed forces involved in the anti-IS fight support conflicting agendas. The Euphrates Valley border area was the heart of the "caliphate" IS proclaimed in 2014 and is now its last redoubt, where a US-led coalition supporting the military effort said around 1,500 jihadist fighters remained. The parallel offensives have sent thousands of civilians running for their lives, some of them straight into the desert. Sonia Khush, Syria director at the Save the Children charity, said an estimated 350,000 people have fled the recent fighting in Deir Ezzor province, half of them children. The Observatory said dozens of civilians were killed and dozens wounded Saturday in an IS car bombing that targeted displaced people on the eastern bank of the Euphrates. Earlier the monitor said civilians were stranded on an island in a meander of the Euphrates directly facing Deir Ezzor and where some jihadist pockets remained. Iraqi forces made light work of Al-Qaim, and while Albu Kamal is now the last urban bastion the jihadists have, it is unclear how much resistance they can or intend to put up. The US-led coalition said anti-IS forces would hunt down jihadists to the last man. "The coalition must and will deny IS safe haven in Iraq and Syria," spokesman Ryan Dillon told AFP. As their dream of a jihadist state continues to disintegrate, surviving jihadists are expected to hide in the desert area straddling the border and go dark for some time. The group has retained its capacity to carry out suicide bombings in cities such as Damascus and Baghdad, as well as to inspire high-profile attacks in the West such as this week's Manhattan truck attack. Despite its defeats on the battlefield, analysts are warning that IS is not down and out in the absence of a political vision to ensure stability in Iraq and Syria. "This absence of a long-term strategy leaves Daesh (IS) a lot of room for regrouping in the near future, while continuing to work its networks of supporters around the world," said Jean-Pierre Filiu, a professor at Sciences Po university in Paris. From the depths of the desert or zones not fully under Iraqi control, "they will attempt to conduct localised attacks to destabilise local governance and maintain external and media operations -- plotting and inspiring attacks overseas and seeking to continue to project a veneer of legitimacy", Dillon said.